Concept2 Model D Olympic Quality – Easy to Assemble – Adjustable Foot Rests- Easy to Control – Sophisticated Digital Monitor- Bluetooth Connectivity – 5 Year Frame Warranty. High end VIEW PRICE HERE! York Fitness R700 Platinum Reputable Brand – Adjustable Handle – Padded Seat – Heavy Duty Foot Plates – 8 Resistance Levels – Compact & Retractable – Display Monitor Mid range VIEW PRICE HERE! Bodymax Infiniti R90 LCD Console- 12 Workout Programs – Air Magnetic Resistance – Optional Heart Monitor – Authentic and Adjustable Experience – Easy to Store High end VIEW PRICE HERE! Skandika SF-1140 Additional Handle – Impressive Digital Monitor – Adjustable Handles – Built in Heart Monitor – Foldable Mid range VIEW PRICE HERE! Skandika SF-1150 Adjustable – Portable – Fold-able- Extra Quiet – Adjustable Handles – Personalised Monitor Affordable VIEW PRICE HERE! Rowing machines are a great way of improving fitness, losing weight and increasing your stamina without putting any unnecessary pressure on your joints. Rowing machines mimic the natural rowing motion that you would do if you were in a real boat and indoor rowing machines can also be a great way to train up for the real thing. Rowing machines are ideal for burning calories, they increase heart function, the low impact style of the rowing machine means you can strengthen your upper and lower body without worrying about damaging your muscles, and you’ll get a great endorphins rush which can help fight stress and depression. Some people use rowing machines as part of their gym session and they can be a great addition to any routine, but if you are interested in owning your own fitness machine for personal use rowing machines are also very effective on their own. We understand that shopping for exercise equipment can be confusing and stressful and you may not know where to begin so we have created this in-depth list of the top 5 rowing machines available on the market today. By the end of this guide you will not only have a lot of options to think about but you’ll have a clearer idea of what to look for in a rowing machine and you’ll be able to make an informed choice. 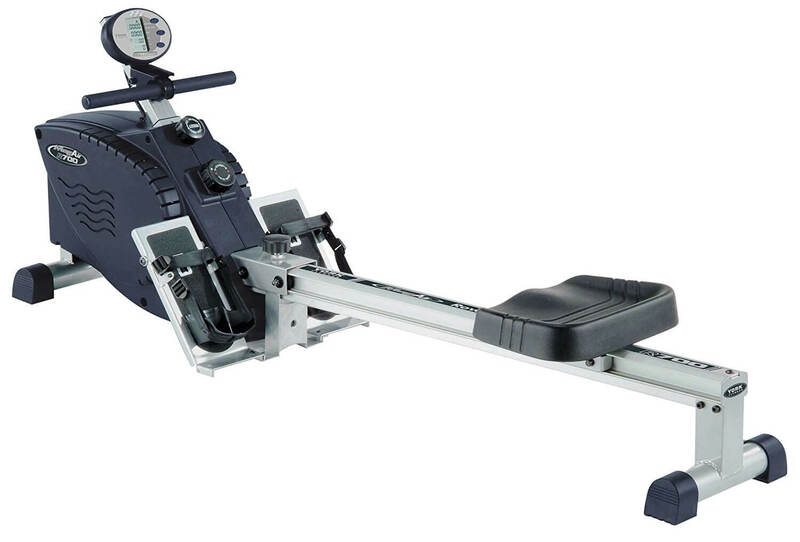 This impressive high-end rowing machine from renowned company, Concept2 (CHECK PRICE!) is great for experienced users and even Olympic trainees! Read on to discover more. 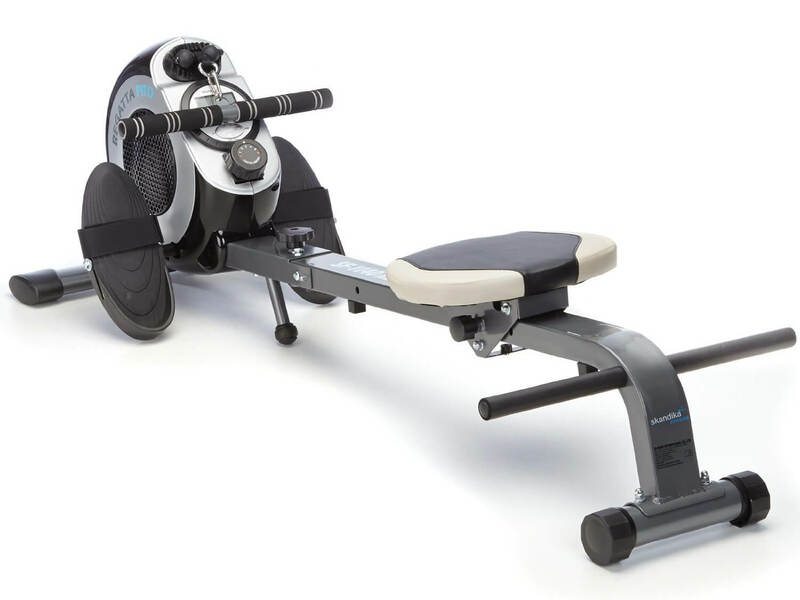 This Model D rowing machine is highly regarded in fitness circles and is the same machine that professional athletes and Olympians use to train! The Concept2 Model D Rowing Machine should only take about 30 minutes to assemble and it has been designed for easy separation and storage. It also comes with front foot caster wheel so you can roll the machine into its desired location and move it away if you need extra space. This Model D Rowing Machine comes with adjustable foot rests which can be adjusted to suit any foot regardless of shape or shoe size. The handle is ergonomic and can bend up to 10 degrees so you can maintain natural movements with greater comfort. This rowing machine responds to your speed and effort and so the faster you go the harder the exercise will become. You can also control your resistance level via the spiral damper located on this device. The Concept2 Rowing Machine comes with a sophisticated and detailed monitor that strives to give you accurate data every time. This monitor is backlit to make it easier to see, it will display relevant and helpful information such as the amount of calories you have burned and the amount of time you have been exercising for, and it offers a user-friendly menu that you can use to select your pre-set workout, change the language settings and even play a game. This machine is compatible with Bluetooth Smart connectivity and ANT+ which you can use for wireless heart rate monitoring and connecting your computer or phone to the machine. This machine comes with a 5-year frame warranty and a 2-year warranty on other parts. The Concept2 company states that this machine was designed to last a life-time and the warranty reflects this promise because if the company had made a flimsy machine they wouldn’t be promising a long warranty, so you can rest assure that this rowing machine will last a long time. Features: Olympic Quality – Easy to Assemble – Adjustable Foot Rests- Easy to Control – Sophisticated Digital Monitor- Bluetooth Connectivity – 5 Year Frame Warranty. This rowing machine is reasonably priced whilst still offering loads of features and perks. Read on to find out more. York Fitness is a reputable fitness brand that has been in business for over 80 years. They specialise in gym equipment ranging from multi gyms to cross trainers so you can feel secure in the knowledge that they know what they’re doing. This R700 model comes with an adjustable handle height so you can customise your rower to suit your individual height, and it also comes with a padded seat which is designed for storage and comfort. The foot plates are heavy duty and come with adjustable Velcro straps to help keep your feet secure during the exercise. The York Fitness uses air and magnetic resistance for a smooth motion, and it offers 8 resistance levels so you can keep pushing yourself and improving over time. This machine is compact and as the seat is retractable the York Fitness R700 can easily be stored out of the way when not in use. This York Fitness rowing machine comes with a display monitor which will help you keep up to date with your progress. It features the calories burned, time per 500 m, distance and strokes per minute so you can set yourself goals and see yourself improve over time. Features: Reputable Brand – Adjustable Handle – Padded Seat – Heavy Duty Foot Plates – 8 Resistance Levels – Compact & Retractable – Display Monitor. The Bodymax is a fold-able, adjustable and versatile rowing machine that is great for those of you who are looking for something a bit more upmarket. Read on for our list of features. This rowing machines impressive LCD console doesn’t just display feedback on your calories, time distance and speed; It also offers 12 pre-made workout programs that you can use to work on your goals and improve the variety and quality of your workout. Some of the programs you can choose from include Race, Recovery and Watt Caloric Burn. You can also create your own user profile to keep track of your progress and set yourself challenges. This machine uses Air Magnetic Resistance for extra smooth motion. The BodyMax R90 comes with an optional telemetric chest belt which can be used to monitor your heart rate and ensure you are challenging yourself without putting yourself in danger. The R90 tries to replicate a realistic rowing experience as far as possible and the closer footrests have been especially designed to feel more authentic. The foot pedals can also be adjusted to suit your shoe size and the machine can be used by short and tall people alike. This is a durable and good quality machine which is still easy to fold and store when not in use. Features: LCD Console- 12 Workout Programs – Air Magnetic Resistance – Optional Heart Monitor – Authentic and Adjustable Experience – Easy to Store. This is a versatile and adjustable rowing machine which can help you achieve your goals through its many impressive features. Read on to find out how the Regatta Pro 5 could benefit you. This rowing machine aims to give you a realistic rowing experience and aims to train up to 86% of your muscles. You can use this machine in the traditional way and work on your lower body, upper body, core and back, but the additional handle means you can also work on upper body strength separately. This Regatta Neptune machine includes an impressive digital monitor which will display your time, calories, speed and rowing strokes. You can also use this monitor to set ourself goals and keep track of your progress. The Regatta Neptune comes with adjustable handles which can be changed depending on the muscle group you want to focus on. It also includes a built in heart monitor which can be used with a chest strap or other device to give you accurate heart rate readings. This machine can be easily folded and stored out of the way, so it is suitable for both small and large homes. Features: Additional Handle – Impressive Digital Monitor – Adjustable Handles – Built in Heart Monitor – Foldable. This is the more affordable budget version of the Skandika 1140, but it is still a versatile and quality rowing machine. The Skandika 1150 can be used as a traditional rowing machine, but it can also be adjusted to suit multiple workout routines and can be used to target a variety of muscle groups. You can also use this multi gym addition whilst squatting, kneeling or standing depending on what you want to work on. Like it’s 1140 cousin the Skandika 1150 is both portable and fold-able, so if space is an issue this may be the brand for you. The Skandika has been designed with poly fibre to be extra quiet, smooth and low maintenance. The Skandika 1150 comes with adjustable handles that you can adjust to target specific muscles groups. This rowing machine comes with a monitor that will show you all the relevant data such as time, calories, speed and strokes. You can also personalise your workout by using the monitor to set your own training goals. Features: Adjustable – Portable – Fold-able- Extra Quiet – Adjustable Handles – Personalised Monitor. Any one of these rowing machines would help you get fit, lose weight and achieve your goals but one machine stands out from the crowd. First place goes to the Concept2 Model D Indoor Rower with PM5 because it is quick and easy to assemble, it is adjustable with an ergonomic handle, you can control the resistance levels manually, you have a range of pre-made workout programs to choose from, you can connect your computer or mobile phone to the machine and, best of all, this product is recommended by professional athletes and Olympic trainees!